Murphy’s essays reported evidence of collusion among financial institutions to suppress the price of gold. Powell, whose newspaper had been involved in antitrust litigation, replied with an essay proposing that gold mining and investor interests should act on Murphy’s essays by bringing antitrust lawsuits against financial institutions involved in the collusion against gold. 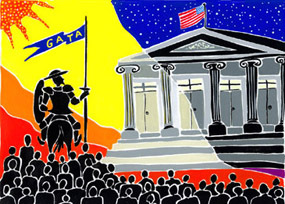 GATA financed the federal anti-trust lawsuit of its consultant, Reginald H. Howe — Howe vs. Bank for International Settlements et al. — which was pursued in U.S. District Court in Boston from 2000 to 2002. While the Howe suit was dismissed on a jurisdictional technicality, it yielded valuable information at a court hearing in November 2001 and became the model for Blanchard Coin and Bullion’s anti-trust lawsuit brought the following year against Barrick Gold and J.P. Morgan Chase & Co. in U.S. District Court in New Orleans, whose settlement appears to have included Barrick Gold’s decision to stop selling gold in advance. Using the U.S. Freedom of Information Act, throughout 2008 and 2009 GATA sought access to the Federal Reserve’s gold-related records, eliciting an admission from the Fed that it has gold swap arrangements with foreign banks and insists on keeping them secret. To obtain the records at issue, in December 2009 GATA sued the Fed in U.S. District Court for the District of Columbia. In February 2011 the court ruled that most of the Fed’s gold records could remain secret but that one had to be disclosed: minutes of the April 1997 meeting of the G-10 Committee on Gold and Foreign Exchange. The minutes, released by the Fed two weeks after the court’s ruling, showed G-10 member treasury and central bank officials secretly discussing the coordination of their policies toward the gold market. The court ordered the Fed to pay court costs to GATA. GATA’s Internet site is www.GATA.org.